TA: Any person, family, business, or group with forest history records can either contact you for assistance, David, or they can contact an archives to discuss the records in their possession. We look to acquire records that document the lives, work, history, and culture of the province, and donors that have some connection to forestry in any capacity should hold on to their materials and make sure to speak with us before throwing anything away! We get this question a lot, and so we recently published Family Histories: Preserving Your Personal and Family Documents , available in English and French, free to anyone who comes to the Provincial Archives. ot Tom Anderson. 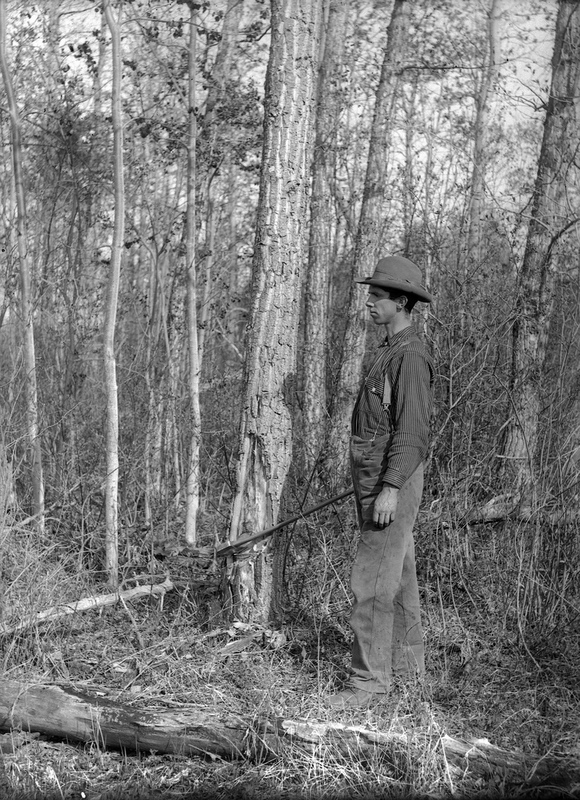 Rather, it’s a woodcutter at Bowden, Alberta, early 1900s (PAA Photo H592). 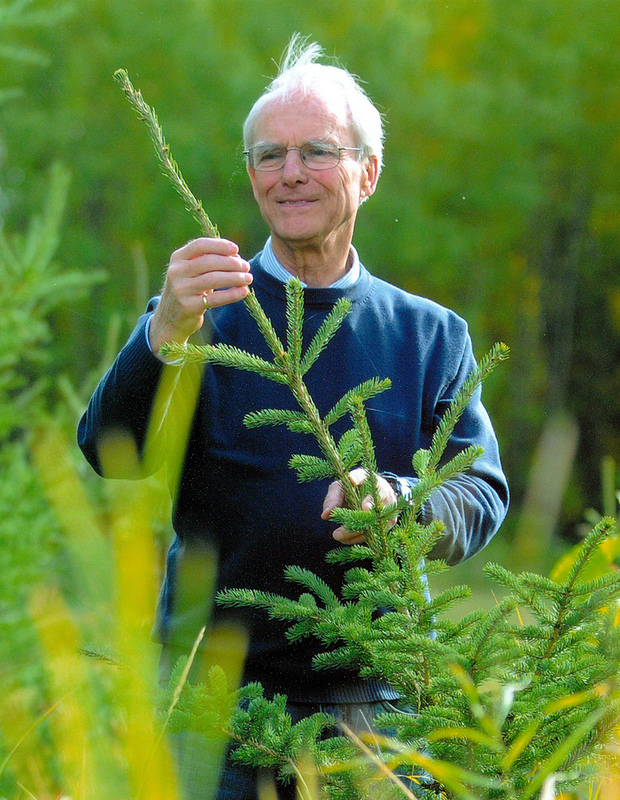 DB: Peter Murphy, tell us a little bit about yourself – how did you become interested in forest history? Peter Murphy: I was raised in Quebec and my outdoor-loving parents introduced me to forests in the Laurentians. That led me to the University of New Brunswick, where I graduated with a degree in forestry in 1953. I worked in the west during summers on a ranch and in forestry. At the end of my third year I worked in forest surveys for the B.C. Forest Service and again for a year after graduation. In my travels through most of the province I was impressed with the history of logging and sawmilling that was so evident, from Lumberton with its flumes in the southeast to Sawmill Row in Prince George and the plank roads from McBride to wet forests south of Smithers. I came to Alberta in the spring of 1954 and saw much the same historical changes as I travelled with forest surveys to Lake Athabasca, East Slopes to Edson, Grande Prairie and Peace River. Forestry was very much in transition, as author Robin Huth later so aptly described in his book, From Horses to Helicopters. I got into training for the Alberta Forest Service in 1956, and so worked and travelled with staff throughout the province and became engrossed with their history and that of the forest industry. When we got our own training facility at Hinton in 1960, then the Forest Technology School, we could begin to collect some of the traditional old tools and equipment that were becoming obsolete and were able to build a modest museum in which to display them. In that way we could also give students and visitors a historical perspective. Students and visitors also gave us an opportunity to start recording lectures and interviews. As well, we inherited parts of the old Dominion Forestry Branch pre-1930 photograph collection; with my colleague Bob Stevenson, who had rescued a major set of them from a garbage bin, and adding private donations, we eventually produced a collection of over 4,000 images available to search on a CD in 2005 with support of the AFS. In the meantime, in 1963 I completed a master’s degree at University of Montana, and in 1968 had a six-month traveling fellowship in Britain, which considerably extended my appreciation of forest history. In January 1973 I moved from Hinton to Edmonton to teach forestry at the University of Alberta until retirement in 1995. In 1985, as an extension of a lengthy term paper as part of my PhD program at University of British Columbia, the Alberta Forest Service published my history of forest and prairie fire control in Alberta. That laid the groundwork for several enjoyable post-retirement forest history projects. And the search for references provided a first-hand understanding of the importance of both public and private archival collections—both appreciation of their availability and despair at their absence. In retrospect, I seem to have bumped into forest history at every turn and enjoyed the many opportunities to explore it. DB: Peter, as a researcher who has made extensive use of the archives, can you elaborate on Tom’s account of how archival material has been used to write Alberta’s forest history? PM: I was lead author for Alberta Forest Service, 1930-2005 , and can attest to the value of PAA. As well, I have drawn on PAA resources for A Hard Road to Travel , Learning from the Forest , and Forest and Prairie Fires in Alberta . In addition, I wrote two chapters for I. S. MacLaren’s book Culturing Wilderness in Jasper National Park , for which I also drew on resources at PAA. PAA is a leading repository for those studying forestry and forest-related topics, but is not the only one in Alberta. Archives such as University of Alberta, Glenbow Museum, and Whyte Museum of the Rockies also have much to offer. They, along with many local archives, such as the Jasper Yellowhead Museum and Archives, serve as important complementary sources of reference materials and photographs. There are also a few private collections of photos and documents that I hope can be consolidated into safer havens and made more conveniently accessible to other researchers. And, although our discussions have focused on the Alberta scene, we need also recognize the substantial collections and services of Library and Archives Canada (LAC) and the Forest History Society in Durham, North Carolina, of which I have been a member for 30 years and a past president. The importance of archived records was impressed on me during the early 1980s when I was researching the contributions of the Dominion Forestry Branch (DFB) to forestry in Alberta. Until 1930 the forests of Alberta were a responsibility of the Dominion government. There were few DFB files available at PAA, so on my first visit to the Library and Archives Canada (LAC) in Ottawa I was surprised that there were relatively few files there, too. I understood from one of the LAC archivists that upon the Transfer of Resources in October 1930, the government of Alberta insisted that all active files be sent to the Alberta Department of Lands and Mines in Edmonton, so that there were relatively few files left in Ottawa to be later transferred to LAC. I recalled then that when I started work with the Alberta Department of Lands and Forests in Edmonton in 1954 that there were great stacks of Dominion files in the basement of the Natural Resources Building, which, I understand, were soon after disposed of. My impression was that, unfortunately, the number of files was so overwhelming, that many were just stored, later to be thrown out. This was before PAA had been established, and which now ensures preservation of provincial government files. However, that experience indicates that identifying and finding homes for privately held materials is also a matter of ongoing importance. The forest history preservation project being conducted by NiCHE, the Forest History Society, and the Canadian Forest Service, is especially important in identifying which Canadian archives are able and willing to accept donations of new forest history collections. The next phases of the NiCHE project will be equally important—first to identify privately held collections in danger of loss or destruction and then to match them with suitable repositories that would accept and make them reasonably accessible for researchers. It is encouraging to see this project progressing so expeditiously. Bott, R., P. Murphy and R. Udell. 2003. Learning from the Forest: A Fifty-year Journey towards Sustainable Forest Management . Foothills Model Forest and Fifth House Ltd.
Huth, Robin A. 1980. Horses to Helicopters: Stories of the Alberta Forest Service . Alberta Forest Service, Energy and Natural Resources. Larmour, Judy. 2005. Laying Down the Lines: A History of Land Surveying in Alberta . Brindle & Glass Pub. Murphy, P.J. 2007. “‘Following the Base of the Foothills’: Tracing the Boundaries of Jasper Park and its Adjacent Rocky Mountains Forest Reserve.” In Culturing Wilderness in Jasper National Park , edited by I.S. MacLaren, 71–122. University of Alberta Press. Murphy, P.J. 1985. History of Forest and Prairie Fire Control Policy in Alberta . ENR Rep. No. T/77. Edmonton: Alberta Energy and Natural Resources. Murphy, P.J. 2007. “Homesteading the Athabasca Valley to 1910: An interview with Edward Wilson Moberly, Prairie Creek, Alberta, 29 August 1980.” In Culturing Wilderness in Jasper National Park , edited by I.S. MacLaren, 123–54. University of Alberta Press. Murphy, P.J. with R.W. Udell, R.E. Stevenson and T.W. Peterson. 2007. A Hard Road to Travel: Land, Forests and People in the Upper Athabasca Region . Foothills Model Forest, Hinton and Durham, NC: Forest History Society. Murphy, P.J., R.E. Stevenson, D. Quintilio and S. Ferdinand. 2006. Alberta Forest Service, 1930–2005: Protection and Management of Alberta’s Forests . Pub. No. I/133. Edmonton: Alberta Sustainable Resource Development.